Any out-of-towner who would guess Western Mass has a quiet craft beer scene is bound for a rude, brewed awakening. 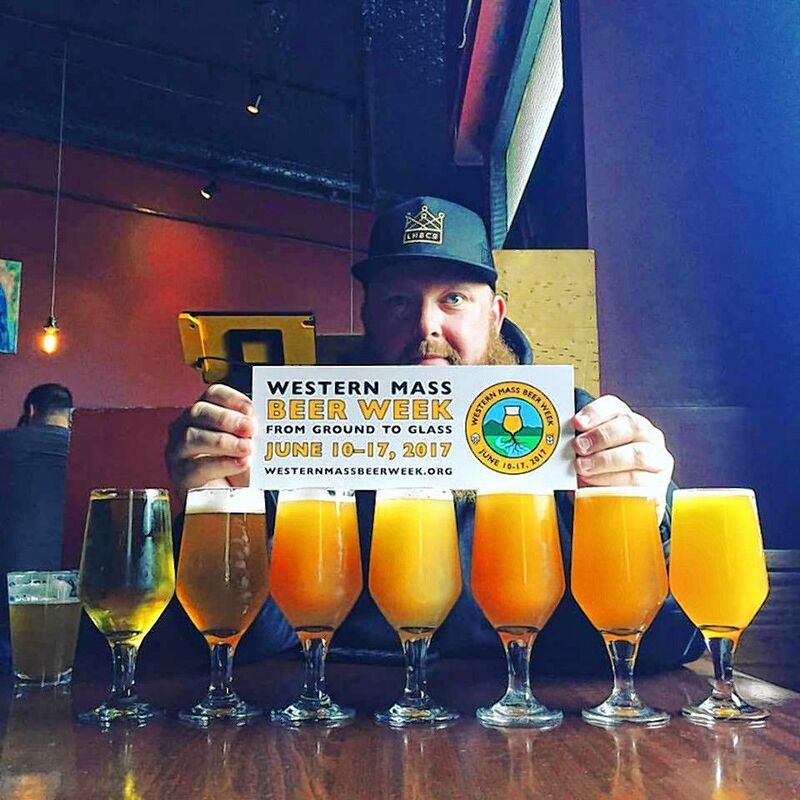 But even locals may be surprised at the scope of the second annual Western Mass Beer Week, which runs June 10-17. Last year’s series of events at breweries, bars and restaurants around the Valley attracted 35 businesses, which hosted (by my count) 52 events. This year, more than 50 businesses are participating in 70 events, plus another seven events that last all week long. Sadly, even Superman couldn’t hit up every single one, so plan your itinerary wisely: stay up to date on Facebook, and check out westernmassbeerweek.org for a full directory of events. BLDG8 Courtyard Kickoff Party in Florence: From noon to 6 p.m. with live music starting at 2 p.m.
Berkshire Craft Beer Festival and Chug Run 5K in Pittsfield: At the Common Park from noon to 5 p.m.
“Abandoned at Lefty’s” Collaboration Beer: Imperial stout aged on scotch barrel chips. Tasting hosted by Abandoned Building Brewing in Easthampton, partnered with Lefty’s Brewing from Greenfield, 3-10 p.m.
Outlook Farm Strawberry Festival in Westhampton: Featuring the release of the farm brewery’s strawberry wheat ale. Noon to 3 p.m.
“Mo Way! Another IPA” Collaboration Beer: Brewed by Vanished Valley in Ludlow and Two Weeks Notice in Westfield. Tasting hosted by The Hangar in Amherst, 2-6 p.m.
“A For Effort” Collaboration Beer: IPA dry-hopped with lupulin powder. Tasting hosted by Abandoned Building Brewing in Easthampton, partnered with Brewmaster Jack from Northampton, 1-6 p.m.
Meat Sweat Monday in Northampton: The Foundry hosts imported beers from Shelton Brothers, with local sausages from Sutter Meats. 4-9:30 p.m.
“Manhan Trail Pale Ale” Collaboration Beer: Tasting hosted by Abandoned Building Brewing in Easthampton 5-9 p.m., or stop in to see the collaborators at Beerology in Northampton for a free sample of the home-brewed version of this ale. Toasted Coconut Creme / Two Sisters Stout Collaboration Beer: Amherst Brewing joins forces with Shelburne Falls Coffee Roasters. Tasting hosted by The Hangar in Amherst, 11 a.m. to midnight. Five-Course Beer Dinner: Hosted by Gateway City Bistro in Holyoke. Limited seating on sale through June 9. 7-10 p.m.
Firkin Faceoff in Northampton: Brewers are challenged to add at least one new local ingredient to their cask beers. Come taste the results at the Foundry, 4-11 p.m.
Berkshire County Launch of Artifact Cider: Come taste local craft ciders and meet the makers. Hosted by PUBLIC eat + drink in North Adams, 6-8 p.m.
White Lion Wednesday Beer Garden in Springfield: With light fare and music. 4-8 p.m.
Waterfalls and Beer: Featuring a special cask offering from Brick and Feather in Turners Falls. Hosted by the Lady Killigrew Cafe at the Bookmill in Montague, noon to 4 p.m.
Cask Night at Iron Duke Brewing in Ludlow: Two special casks and a food truck. 3-10 p.m., with live music beginning at 7 p.m.
Meet the Brewer of Hitchcock Brewing: Sample beers with Rich Pedersen as he discusses his Whately operation. Hosted by Champney’s in Deerfield, 6-8 p.m.
Rum Barrel-Aged Ginger Beer Release Party: Hosted by New City Brewery in Easthampton. 4-11 p.m., with live music from Khalif Neville at 8 p.m.
Bear and Bramble Brewing: Taste beers with the specialty brewers from Florence. Hosted by Seymour in Greenfield, 7-11 p.m. Welcome to the Garden: Element Brewing Company in Millers Falls opens their new outdoor beer garden in celebration of their new distillery. 6-9 p.m., featuring live music from Dave Brule and his irish folk band. Artisan Beverage Tap Room and Parking Lot Party: The makers of Ginger Libation host a shindig featuring mead, kombucha, libations, and the Sun Kim Bop Korean food truck, 4-7 p.m.
Five Dollar Pint Night: Hosted by Brew Practitioners in Florence, 2:30-11 p.m. With live music from Galvanizer 7:30-10:30 p.m. The Worthy Brewfest: Seventh-annual event features nearly 30 breweries and a matching 30 homebrews. Hosted by Smith’s Billiards in Springfield, noon to 4 p.m.
Party at Honest Weight Artisan Beer in Orange: Featuring casks, special drafts, and the Dogfather food truck. Noon to 9 p.m. Hopped Up For Health 5K and 12K: Hosted by Big Elm Brewing in Sheffield. Two races start and finish at the brewery, to raise money for Volunteers in Medicine. Includes live music, food trucks, games, and prizes. Register online. 9:30 a.m. to 6 p.m. Pedal 2 Pints Summer Ride: Bicycle tour of Valley breweries starts and ends at Berkshire Brewing Company in South Deerfield. Five routes to choose from. Register online.